Other Names: "The World's Strongest Man", "The Italian Strongman"
History: Adolfo Bresciano was born an Italian, but as the years went by, he soon became known as one of the strongest wrestlers to ever come out of Canada, as well as moving into a major heel spot in the WWF. Sadly, this was all later covered over by Bresciano's sudden demise in his Montreal apartment. 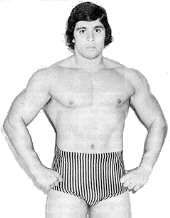 Known as "The Italian Strongman", Dino Bravo started wrestling in Montreal in 1970, being introduced as the cousin of Gino Brito. He took his name from a 1950's wrestler, "The Italian Cassanova". Bravo quickly became known as a powerful wrestler, with a massive torso that could throw opponents all over. 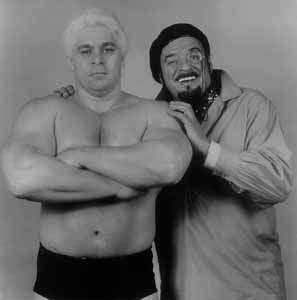 He and Brito formed a successful tag-team together, going as far as winning the Grand Prix tag-team titles in 1973. Bravo soon became the star of the Montreal-based circuit, as well as moving into various federations of the NWA. Throughout the 1970's, Bravo showed himself to be a great tag-team wrestler, forming different teams with Victor Rivera, Mr. Wrestling, Tiger Conway Jr, and Dominic Denucci, who along with Bravo won the WWWF Tag-Team Titles in 1977. In 1978, Bravo finally began to break away from his tag-team fame, entering a singles tournament for the new NWA Canadian Championship. Surprisingly, Bravo went all the way, winning the title, and would either stay the champion or be a major contender for it the rest of the '70s. Bravo would switch belts in the 1980's, going after Montreal's Canadian International Heavyweight strap. He was very successful at it, winning the gold six times and staying the central wrestling presence in Canada at the time. Unfortunately, this also ended up working against Bravo's career. Bravo had entered the WWF again in 1985, competing against various opposition. This led to a scheduled match in January 1986 against Hulk Hogan in Bravo's "home country". However, since the audience in attendance was obviously pro-Bravo, the match was canceled at the last minute, to keep the WWF's top star from being booed. Angry at the decision, Bravo quit the WWF, opting to return as a star to Canada. However, after a year, Bravo and the WWF settled their problems with each other, and Bravo made his return to the organization, bleaching his hair blonde and refering to himself as the World's Strongest Man. He joined up with Greg "The Hammer" Valentine, with the two being refered to as the new Dream Team (Valentine was formerly partnered with Brutus Beefcake). During this time, Bravo switched around with various managers, working with Frenchy Martin, Johnny V, and finally Jimmy "Mouth of the South" Hart. At the first-ever WWF Royal Rumble in 1988, Bravo became famous by trying to lift a then-record 710 pounds. He (and Jesse "The Body" Ventura) proclaimed his attempt a success. No one else recognized the lift. Nonetheless, Bravo began to call himself "The World's Strongest Man". Over the next few years, Bravo would have running feuds with many other mid-carders, including "Magnificent" Don Muraco, Ken Patera, "Hacksaw" Jim Duggan and Rugged Ronnie Garvin. Bravo's move to the main event, though, occurred in 1989. On a televisied WWF show, Bravo challenged the Ultimate Warrior to a push-up contest. He called the largest, fattest person he could out of the crowd, bringing him to the ring to sit on the backs of both wrestlers. Bravo easily completed his push-ups, then challenged the Warrior to do the same. When the Warrior tried, though, the man crushed him to the mat, then joined with Bravo in a beat-down. This was the first appearance of the Canadian Earthquake in the WWF, the man who became an immediate threat to Hulk Hogan's World Title, as well as making Bravo one of the top heels. The Canadian squad quickly became the most likely to put wrestlers on in injured list, with the Earthquake's massive crushing drop on their chests. 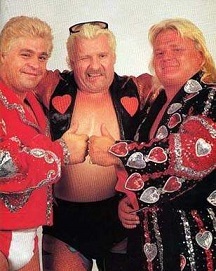 During 1990, the dangerous duo, along with other wrestlers like Greg "The Hammer" Valentine, leveled many top stars. However, Bravo became more the coach than the wrestler, usually only there to further the Canadian Earthquake's chances of winning. Although heralded as a major heel, Bravo would lose many matches in 1990-1991 to the good guys, helping to put Hulk Hogan over even more as the top face. When the Earthquake began teaming with Typhoon (formerly known as Tugboat), Bravo's stature in the company faded away. Later on in 1991, Bravo dyed his hair brown and tried a face run, feuding with the Mountie. The move wasn't successful, however, and Bravo soon moved down the card, rarely appearing on any PPVs. Spent from decades of wrestling, Bravo retired in 1992. His next memorable moment would be in the obituary section. On March 11, 1993, Adolfo Bresciano was found shot to death in his small apartment in Canada. There had long been rumors that he was connected with organized crime in Montreal, and the execution-style shooting led to growing speculation that he was killed due to his possible involvement in black-market cigarette sales. However, no reports were ever published in regards to his case. Although many only remember Bresciano for the way his life ended, true Dino Bravo fans keep the memories of his great wrestling talent alive. He will always be seen as one of the greatest Canadian stars of the '70s, and it's still speculated today how far he could have gone in American hearts if he hadn't been a star during Hulkamania. - WWF Survivor Series '87 = The New Dream Team (Bravo & Greg Valentine), the Hart Foundation, Demolition, the Islanders & the Russians competed in an "Elimination" Match against the British Bulldogs, the Killer Bees, Strike Force, the Rougeau Brothers & the Young Stallions. The Killer Bees & the Young Stallions were the 'survivors'. - WWF Royal Rumble '88 = Bravo competed in the Royal Rumble, which was won by Jim Duggan. - WWF Wrestlemania IV ('88) = Bravo lost, via DQ, to Don Muraco. - WWF Summerslam '88 = Bravo defeated Don Muraco. - WWF Saturday Night's Main Event #17 (October 25, '88) = Bravo won over Ken Patera. - WWF Survivor Series '88 = Bravo, Mr. Perfect, Harley Race, Rick Rude & Andre the Giant competed in an "Elimination" Match against Jim Duggan, Jake Roberts, Tito Santana, Ken Patera & Scott Casey. Bravo & Mr. Perfect were the 'survivors'. - WWF Royal Rumble '89 = Bravo & the Rougeau Brothers fell to Jim Duggan & the Hart Foundation. - WWF Wrestlemania V ('89) = Bravo pinned Rugged Ronnie Garvin. - WWF First UK Event (October 10, '89) = Bravo took down Bret Hart. - WWF Survivor Series '89 = Bravo, the Canadian Earthquake, Randy Savage & Greg Valentine competed in an "Elimination" Match against Jim Duggan, Bret Hart, Rugged Ronnie Garvin & Hercules. Bravo, Earthquake & Savage were the 'survivors'. - WWF Royal Rumble '90 = Bravo competed in the Royal Rumble, which was won by Hulk Hogan. 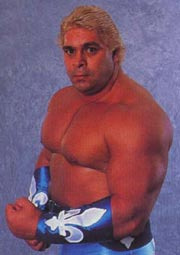 - WWF Saturday Night's Main Event #25 (January 30, '90) = Bravo took down Ronnie Garvin. - WWF Main Event III (February 23, '90) = Bravo fell to the Intercontinental Champion, the Ultimate Warrior. - WWF Intercontinental Title Tournament (April '90) = Bravo and Brutus Beefcake fought to a Double Disqualification. Mr. Perfect won the tournament. - WWF Wrestlemania VI ('90) = Bravo was beaten by Jim Duggan. - WWF Survivor Series '90 = Bravo, Earthquake, Haku & the Barbarian competed in an "Elimination" Match against Hulk Hogan, Jim Duggan, Tugboat & the Big Boss Man. Hogan was the sole 'survivor'. - WWF Royal Rumble '91 = Bravo competed in the Royal Rumble, which was won by Hulk Hogan. - WWF Main Event V (January 28, '91) = Bravo & the Earthquake lost to Hulk Hogan & Tugboat. - WWF Wrestlemania VII ('91) = Bravo fell to Kerry von Erich. - WWF UK Rampage (April 19, '92) = Bravo & Col. Mustafa were beaten by the Legion of Doom.